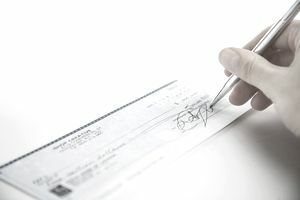 When writing a check, you have to specify the amount using numerals (in the box on the right-hand side) as well as words (on the line that says “Pay”). This practice helps to avoid confusion; if it’s difficult to read one section, you can always double check using the other section. Sometimes the amounts written on a check do not match. For example, a check may show a numeric value of “$100,” but say it should be payable for “ten dollars.” What happens when these numbers don’t match? Written words are supposed to trump the numerical digits, but it doesn’t always happen that way. When a check gets deposited, whoever processes the check might not notice that there’s a discrepancy. In some cases, they might only look at the numbers in the courtesy box and process the check for the wrong amount. It’s easy for this to happen. Think about when you receive a check: do you look at the numbers in the courtesy box, or do you read the amount off the legal line? Most people glance at the courtesy box because it’s faster and easier (this sometimes even applies to busy tellers and ATM operators that handle deposits). It may not be the end of the world if a check is processed based on the numbers in the courtesy box -- sometimes that’s the amount that the check writer intended to pay, and it’s what the payee expected. However, it’s not a good idea to use checks when the amounts don’t match, even if you think you’re getting away with it. The banks working behind the scenes may discover the contradiction and make unwelcome account adjustments later. Whenever a check has contradictory amounts, it’s best to use a different check. In some cases, it’ll be a non-issue, but it’s not worth the risk of dealing with disputes and delays. If you wrote the check, void the check and write a new one. Otherwise, you never know how much your payee’s bank will process the check for. Consider an example with a mortgage payment: if your amounts don’t match, what will happen? If the bank takes less than your payment, you may have to pay penalties for late payment, and your credit may suffer if it looks like you’re not making your payments. If the bank takes more than you wanted, you may run low on cash in your checking account, and you won’t be allowed to reduce your payment to make up for it in the following month. If you receive a check with mismatched numbers, things are not so simple. It may be difficult or impossible to get another check, but it’s probably worth your time to try. If a check is processed for more than intended, you’ll have a very unhappy customer on your hands (or somebody may overdraw their bank account). If a check is processed for less than you expected, you’re out of luck unless you can somehow get the money you’re due.